Whether you need extra load capacity, quieter operation, precision indexing, or specialized belting, QC Industries' Industrial Series offers a solution. The 125 Series' very low profile - a tiny 1.89" - lets these conveyors work in places where conventional conveyors cannot. These versatile units set the standard for industrial grade conveyors in machine integration and are suitable for almost any application. Flextrac combines the versatility of 125 Series conveyors with the benefits of plastic chain belting: higher capacity, non-slip belt tracking, easy replacement of chain modules. Over 100 belt styles available for assembly, automation, or material handling applications. 2.41" to 3.01" profiles. 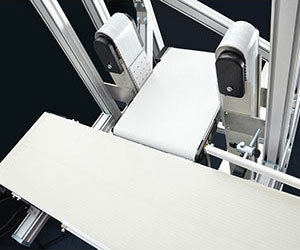 With 3" high frames, heavy duty 400 Series conveyors are only slightly thicker than other low profile conveyor models. That slim difference in height provides higher load capacity — up to 600 lbs. — and greater maximum lengths and widths, while still allowing these conveyors to fit in tight spaces. Indexing conveyors provide stop/start cycling that moves products a precise distance then holds them in place long enough to complete a process such as assembly, stamping, or filling. Low profile, high speed, easy to integrate, and accurate within ±.015". These conveyors utilize a motorized pulley, so there is no external drive to interfere with operations in tight spaces (2.54" total profile). The enclosed 24vcd motor is quiet, compact, maintenance-free, energy efficient, and safe. Perfect for lighter duty operations.